It is really hot at the moment, so I do not want to spend more time next to a hot oven then necessary. 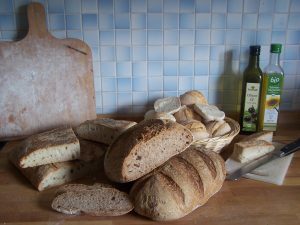 But on the other hand I want to have freshly baked bread for the next week. So what to do? Baking only once this weekend, but then a great amount. To keep the overview over the diffrent recipes I created a schedule on which I marked all fermenting, proofing and baking times. It helps me in the lab on stressful days and it helps in the kitchen also. I make dough from about 3.6 kg flour. 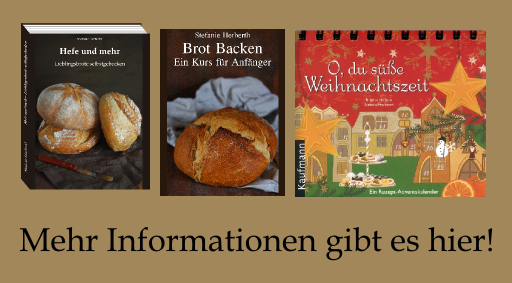 On my schedule: foccacia, whole grain bread and Bauernbrötchen nach Bäcker Süpke. I have the Bauernbrötchen on my toDo List since I saw them on Deichrunner . She baked them with a little change and used more water like her frind Marla suggested. I changed the recipe a little bit, too. Instead of rye I used whole grain wheatflour and increased the water amount. I decreased the yeast amount also, like nearly always, and allow the dough to ferment longer. And I used a little bit more potato then Bäcker Süpke, because my potato wights about 100g and I did not like to waste 20g. My baking stone is to small to bake all rolls at once, so I place half of them in the fridge for one hour. The rest proofed at 27°C for nearly 30 min. A very good recipe for rolls with a nice crust, fluffy crumb and a delicious taste! Poolish: Dissolve yeast in Water and mix with the flour untill homogenous. Sourdough: Mix flour, starter and water untill homogeneous. Fermet bot sourdough and poolish for 18 hours at room temperature. Dough: knead all incredients for 5 min on slow speed, then 8 min on high speed. Rest for 60 min at a warm place. After resting weigh pices a 80g and form them to bowls. Now use the edge of your hand to press in the middle of the bowl. Fold it together and roll the ends, giving the roll two pointed ends. Let rise with the seamside down for 30 min. Preheat the oven with the baking stone at 250°C. After rising, turn the rolls, so the side on which they were lying during rising is now the upper part. Bake the rolls on the hot stone with steam for 25 min. Ich sende diesen Eintrag zu Susans wöchendlichen Yeastspotting, bei dem es immer ganz wunderbare Brote zu bewundern gibt. 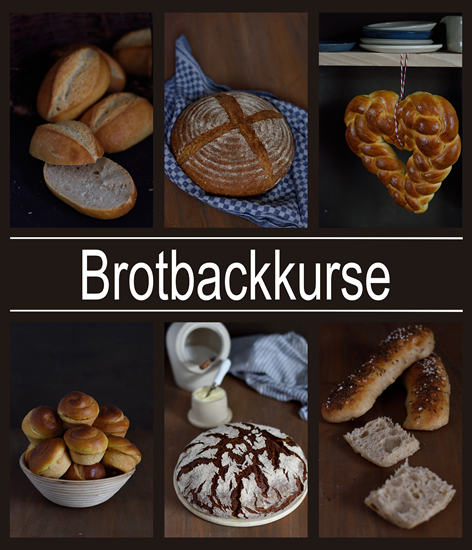 fast hätte vergessen, hier Rückmeldung zu geben: Habe am Sonntag diese Brötchen gebacken, allerdings mit Roggensauer wie im Süpke-Original-Rezept. Die waren so lecker, daß ich gleich mal 2 Stück zum Abendessen verputzt habe. I just love to bake bread and this recipe seems very tasty and also the buns are so cute! Will be visiting your blog often! 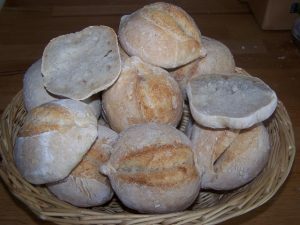 Toll sehen deine Brötchen aus und so hat man gleich eine Variante zum Ausprobieren – danke! Schön was so in der Blogger welt probiert wird!